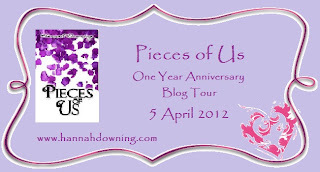 It’s the one year anniversary of Hannah Downing’s Pieces of Us. To celebrate, Hannah has gathered together some of her author friends and review blogs to host a blog hop with prizes. We all love prizes, don’t we? More on that later. First, I want to share my review of the book. Charlotte Barnes believed her life was perfect until a betrayal forced her from everything she knew and loved. Devastated and trying to put the past behind her, Charlotte sought a new life in a new town. Now, five years later, her fiancé has convinced her it’s time to return home and face her past. But will the truth she learns and the people she reconnects with destroy her carefully crafted happiness? Hannah Downing has created an emotional rollercoaster about lost love and the way one indiscretion can change the course of your life. Charlotte questions every decision she’s ever made, but she may discover that when you lose everything, you can truly find yourself. So, this has been on my TBR list since release and I finally read it when I signed up for the blog hop. The reason I left it so long is that Pieces of Us deals with a tough subject matter and that’s infidelity. I’m no stranger to either side of that coin but at this stage of my life I have pretty hard line views on a lot of subjects. This is one. I have zero tolerance. Setting that aside and judging the book on its own merits and how the author dealt with the subject matter, I was pleasantly surprised. Charlotte’s turmoil felt very real to me. It is a simple fact that when a relationship breaks down there is more lost than the relationship between the couple. There is a ripple effect that doesn’t end with the wider family but seeps into all future relationships. 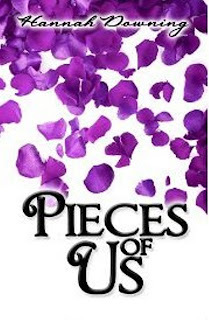 Pieces of Us very nicely showed how one person can put their own feelings ahead of others in both a negative and a positive way. For Charlotte that was the man who cheated and the man who realized to move forward, she must resolve her past. It also showed how facing the past can have rewards. This was a quick read and intense at times, yet it left me with a feeling resolution for Charlotte that I was happy with. For full details of how to win prizes drop by Hannah’s blog. Wonderful review, Carol! I loved this novel and I like how you pointed out the ripple effects of the infidelity. The relationships seemed realistic to me. How much did you like Owen? I liked Owen. I don't know how I would have handled being in his position. He was a good man. It is a good point about the ripple effect. I've delt with this topic in many different ways in real life I think it would be interesting to see how the characters in the book handle it. Thank you for your review. I always appreciate a story that leaves me with a satisfactory ending. Good to know. Wow what a great review! When I am looking at a book to read, I always look at everyone's review on the book just to see what they thought of it. Your review makes me want to read it. Thank you for hosting Carol.